Strategically located right next to the Queen Victoria Village (or QV, a shopping and entertainment precinct) and directly opposite the Melbourne Central, the State Library of Victoria is a remarkable landmark in Melbourne impossible to be missed. A visit to the State Library of Victoria is like taking a trip to the ancient Rome with an unspeakable mission to discover hidden gems amidst the trove of treasures. With its gigantic Roman style columns of distinctive capitals, elegant truss roof, and the intricately crafted dentils, the exterior of the library is a marvelous architectural view. Designed by the same architect who also later created the gorgeous Melbourne Town Hall and the heritage-listed Royal Exhibition Building, the library was officially opened for the public in 1853, and remains one of the most well loved libraries of the Melbournians of all time. Once you have done admiring the magnificent Roman Revival building from the outside, stepped into the library and be impressed by the imposing octagonal space of the domed reading Room, its panoptic layout of wooden reading tables, and the awesome collection of books. I could spend hours at the Cowen Gallery admiring those breathtaking paintings with scenes of European early settlement, historical Bourke Street and the old trams. The gallery is an amazing visual education of the rich Victorian early history. My personal favourite is the painting depicting the Australian local aborigines discovering the body of a white man (William John Wills, an explorer) at Coopers Creek, June 1861 (painted by Eugene Scott, c 1862). In 1860-61, a group of European men initiated an expedition in the quest to cross Australia from Melbourne to the Gulf of Carpentaria in the north, a fearful distance of 3,250 kilometers. The expedition troupe left Melbourne in an atrocious weather in winter, with dreadful road conditions in tumbledown wagons. The return journey from the Gulf of Carpentaria was further hampered by monsoon downpours and shortage of food supplies. 7 men lost their lives in the expedition, and only one Irish soldier crossed the continent and returned alive to Melbourne. What made the story an irony is that when the local aborigines discovered the starving and malnourished explorers, the indigenous extended their aiding hands and offered them food. But the kind gesture was turned down out of suspicion. Wills eventually starved to death. 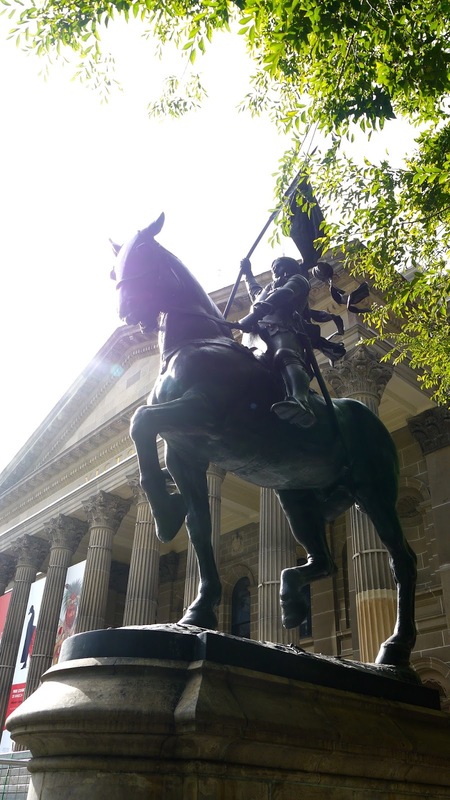 The State Library is not just a custodian of books and journals; it is also the keeper of abundance of amazing collections, including the armour of the controversial Ned Kelly (he was either the Australian’s equivalent of Robin Hood or a murderous villain). It is an open university where various thought-provoking lectures and talks are held throughout the year, featuring historians, authors, illustrators, curators, collectors, archeologists and many other interesting figures. It is a discovery centre where historical significant objects such as old posters, diaries of soldiers, photographs and artifacts from the first settlement and rare English printed books are displayed. The library is also the best place to enjoy a good book, and a fantastic place to get free and extremely fast Wifi connection. With its rich collection of over 2 million books (and a further of 70,000 added to its collection each year), surely there won’t be any dull moment spending time in this treasure trove of knowledge. Various stunning statues can be found around the exterior of the library. 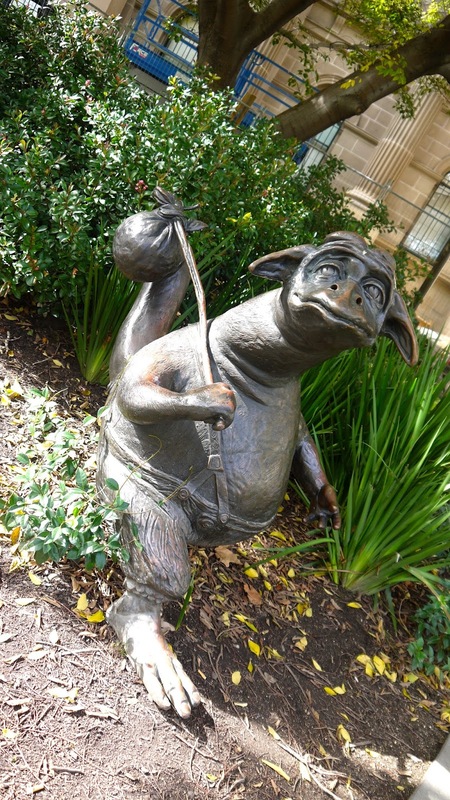 The cutest (and another of my personal favourite) is the bronze statue of a character from Jenny Wagner’s book the Bunyip of Berkeley’s Creek. A bunyip is a mythical creature appearing in many Aboriginal legends. The adorable looking character from this well-beloved Australian children book believes that he was a bunyip, and had a prolonged and lonely identity struggle; No one appeared to understand this poor little character, and he was told cruelly that he was “like nothing at all” simply because such creature does not exist in this world! Other spectacular statues include the St George and the Dragon (a legend of a Roman soldier from Turkey), and the Joan of Arc (a heroine of France). The grassy lawn in front of the library’s entrance on Swanston Street is a fun hub where free entertainments like funky breakdancing and giant chess playing can be viewed. It is also a favourite lunch spot for many of the city’s workers and students. These sum up why I love the State Library of Victoria, and why you must pay it a visit too (if you have not already done so)! Closed on Good Friday, Christmas Day, Boxing Day and New Year’s Day.